We are gathered here today in order to close, in full responsibility, a grim chapter in our country’s past. I have read with great attention the Final Report of the Presidential Commission for the Analysis of the Communist Dictatorship in Romania. In this document, I have found the reasons whereby I can condemn the communist regime. For the citizens of Romania, communism was a regime imposed by a political group self-designated as possessor of the truth, a totalitarian regime born through violence and ended through violence. It was a regime of oppression, which expropriated five decades of modern history from the Romanian people, which trampled law underfoot and forced citizens to live in lies and fear. The Presidential Commission was established in April 2006, in response to society’s demands that the totalitarian past should be assumed and condemned. We considered it necessary to constitute the Commission precisely in order to substantiate intellectually and morally the act of condemnation. We did not wish for a merely formal repudiation of the communist past, at the level of declarations of complaisance. Such a condemnation would have been unconvincing. We demanded of the Commission a rigorous analysis of the components of the totalitarian system, of the principal institutions that made this tragedy possible, and of the personages decisively implicated in the system. We required a thorough analysis of the communist system in Romania. The Commission has accomplished this, in more than six hundred pages, for which I thank them. There is a continuing need for pertinent analyses regarding the Party apparatus and the structures and methods of the Securitate. We need to have a clear X-ray picture of what occurred in the economic sphere, where aberrant industrialization and a command economy produced consequences that are still visible. We need to have as many details as possible regarding the collectivization of agriculture, forced displacement of persons, the persecution of those who resisted, the destruction of the elites and the traditional education system, the persecution of religions and the arrest of religious figures. We have the data necessary to condemn the communist regime in Romania without right to appeal. A democracy without memory is one that finds itself in grave suffering. We must not forget, in order to avoid the errors of the past. The Commission’s conclusions, which I espouse, confirm that the totalitarian communist regime in Romania was imposed by foreign dictate. Indeed, it was a case of an illegitimate regime, founded upon a fanatical ideology, an ideology that systematically cultivated hatred, an ideology for which the “class struggle” and the “dictatorship of the proletariat” symbolized the essence of historical progress. Imported from the USSR, the communist ideology justified the assault against civil society, against political and economic pluralism; it justified the annihilation of the democratic parties, the destruction of the free market, extermination by assassination, deportations, forced labor, and the imprisonment of hundreds of thousands of people. Behind the mask of “socialist humanism” lay concealed the most profound contempt for human beings as individuals. Based on an examination of the analytical literature and of the existing testimonies, which prove the anti-patriotic nature of communist totalitarianism, we can affirm that the communist regime in Romania (1945-1989) was illegitimate and criminal. I do not deny that there were periods of relative lull and that some people believed in the system. However, for the overwhelming majority of the population it was a case of a mutilated existence, lived under direct or indirect terror and in which the notion of freedom had lost all meaning. The time has therefore come for us to evaluate the nature and the legacy of the communist regime. Some have succumbed to the temptation to idealize the Gheorghe Gheorghiu-Dej period, forgetting the fact that the latter established and consolidated the communist terror in Romania, which claimed the lives of thousands, while the Nicolae Ceauşescu regime installed itself on ground already prepared and cleared. Others have tried to excuse the horrors of the Ceauşescu period in the name of supposed devotion to national values. The truth is that the latter were invoked and exaggerated only in order to consolidate the power of a group, by recourse to ostentatious patriotism. In other words, the communist regime in Romania, a totalitarian system based on the constant violation of human rights, on the supremacy of an ideology hostile to the open society, on a monopoly of power exercised by a limited group of individuals, on repression, intimidation, humiliation and corruption. Romania suffered the consequences of the application of Leninist dogmas: forced industrialization, founded on an obsolete economic model, which favored heavy industry; the liquidation of private property, combined with the brutal policy of the collectivization of agriculture; the annihilation of traditional values in the name of a false social modernization; and the methodical control of the social space and citizens’ private lives (in particular through the natal policies of the N. Ceauşescu dictatorship). The private sphere was thus almost wholly annexed by the totalitarian party-state. Everyday life under state socialism was invaded by elements of propaganda and control dictated by the Party. During the period between 1945 and 1965, dominated by Gheorghiu-Dej, the thesis of “heightened vigilance” and “intensification of the class struggle” was applied. It was then that the Securitate was created as the central institution of the repressive system. The Report offers disturbing data about the Romanian Gulag, with its penitentiaries and camps for extermination through forced labor. Sighet, Aiud, Gherla, Piteşti and the Danube-Black Sea Canal are just some of the names on this veritable map of death. Under Ceauşescu, in spite of the promises regarding the strengthening of “socialist legality”, there was a continuation of the demonization of private property, the persecution of religious faiths and practices, and the criminalization of any form of opposition. No less significantly, Ceauşescu and his regime took the policy of persecuting women and children to the point of paroxysm: following the outlawing of abortions and methods of contraception, the orphanages overflowed with children whose fates were, in the majority of cases, compromised from the moment they were born. Dissidence was mercilessly crushed by the regime’s watchdogs and their principal tool, the Securitate. I here make mention of the constant actions of marginalizing, compromising and liquidating every form of free thought and action: the persecution of the movement initiated and led by Paul Goma, the most important act of collective protest against violation of human rights; the arrests and persecution among the ranks of the miners who launched the strike of summer 1977; the savage persecution of Vasile Paraschiv and other activists engaged in the struggle for free trade unions; the destruction of the effort to create the Free Trade Union of the Working Men of Romania; the actions against dissidents, opponents and critics of the regime. Nor should be forgotten the repressive actions against the Romanian Orthodox Church, the Graeco-Catholic Church and Protestant and Neo-Protestant denominations. In 1975, Nicolae Ceauşescu signed, in the name of Romania, the Final Act of the Helsinki Conference. Far from abiding by the commitments it assumed at an international level, the communist regime continued to violate the rights of citizens. The Party was the brains of the repressive system, while the Securitate was the tool which put political decisions into practice. The officers of the Securitate and of other units of the Ministry of the Interior were those who engaged in the direct surveillance and intimidation of the populace. The Securitate, the militia, military prosecutors and border guards were in their turn directly subordinate to the specialized departments of the Central Committee of the Romanian Communist Party. Ministers of the Interior and the heads of the Securitate were, to a man, loyal soldiers of the Party. Most of them were themselves Party activists before working for the Securitate. When we attempt to expose the mechanisms of the totalitarian regime, it is the case not to forget that its architects and beneficiaries demonstrated no form of scruple or remorse. The regime invented institutions designed to make possible the destruction of free mind and to enable the total manipulation of the subjects of the totalitarian state: the Party as a self-appointed elite; the secret police (with its domestic and foreign arms); propaganda and agitation; a pseudo-legal system entirely subjugated to totalitarian interests. I am in total agreement with the Report’s conclusion that, beyond a few minor nuances, the communist leaders of Romania remained faithful to the basic precepts of Leninism as a means of control and maintenance of totalitarianism based on the utopia of fake social egalitarianism. It was this ideology that was indeed in power. 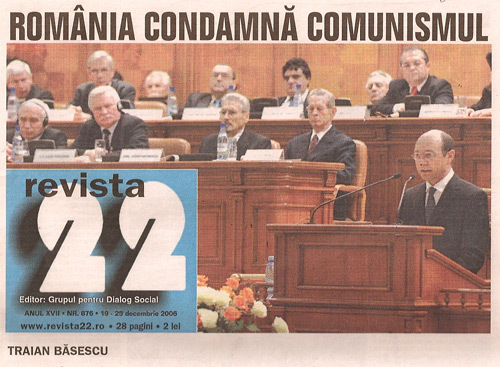 The legacy of the Romanian People’s Republic /the Socialist Republic of Romania, taken to absurd lengths in the final years of the Ceauşescu period, was therefore one of despotism, of the destruction and marginalization of genuine values, of the elimination of the political, cultural and religious elite, and of national isolation in relation to innovative trends in the world of ideas and in technology. (1) Abandonment of national interests through subservience to the USSR after the imposition of the puppet government led by Petre Groza (6 March 1945. Thus, an era began which resulted in the retardation of our history by a number of decades. (5) The policy of annihilating entire social categories in the name of the class struggle. The most prestigious figures of Romania’s elite were eliminated either by assassination or by deportation, imprisonment, forced labor and marginalization. Recourse was made to a logic of collective guilt and the persecution of the families of those suspected of anticommunist intentions or actions. Recourse was made to the utilization of aberrant criteria in order to destroy the opportunities of children from families of “unhealthy background”, preventing them from studying in higher education. As a consequence of the policies of the communist regime, hundreds of thousands of people were detained in prisons and camps, deported or displaced. The figures put forward by researchers, taken into account by the Commission, can be situated between 500,000 and 2,000,0000 victims. The difficulty in making an estimate arises from the systematic concealment of information regarding the fate of many of these victims by the Securitate, State Prosecutors, Militia, Border Guards and other repressive agencies. (8) The repression of religions and the extermination or persecution of all those who opposed communism, both from the ranks of the Romanian majority and from the ranks of the ethnic minorities; the oppression of the Orthodox Church, the abolition of the Graeco-Catholic Church, the persecution of the Zionist movement. (9) The arrest, murder, political detention and deportation of peasants who resisted collectivization. The violent liquidation of peasant revolts (1949-1962). (10) Deportation for purposes of extermination. Ethnic oppression. The harassment and “sale” of Jews and Germans. (12) Repression of the student movements and actions of 1956. The trials against student demonstrators, organized by the PMR (Romanian Workers’ Party), UTM (Union of Working Youth), UASR (Union of the Student Associations of Romania) and the Securitate (1958-1960), as well as the judicial frame-ups of 1965 and the years that followed. (13) Repression of the workers’ movements in the Jiu Valley (1977) and Brasov (1987) and of the other strikes of the 1980s. The arrest and deportation of protesting workers. (14) Repression of opponents and dissidents in the 1970s and 80s. The arrest and assassination of the most courageous opponents – the murder of engineer Gheorghe Ursu, the sentencing to death of diplomat Mircea Răceanu, arrested and tried in 1989; the sentencing to death of persons considered guilty of treason by the regime. (15) The destruction of historic and cultural heritage in the demolitions of the 1980s, inspired by the megalomania of Ceauşescu and the obsession with liquidating major cultural and historical landmarks. The forcing of part of Romania’s population to abandon their homes in the name of the policy of “systematizing” rural areas. (16) The disastrous consequences of the “demographic policy” (1966-1989), which claimed thousands of victims. (17) The imposition of aberrant norms regarding “rational alimentation”, the starving of the populace, the cessation of heating, the state of poverty, of desperation arising from the physical degradation to which the regime subjected an entire nation. (18) The use of material and moral poverty, as well as hunger, as tools to maintain communist power. Claiming that it was fulfilling the desiderata of Marxism, the regime treated an entire population as guinea pigs, subjecting them to an absurd experiment in social engineering. (19) The destruction of the moral reference points of Romanian society and of its values of solidarity, in the absence of which no nation can become the free author of its own history. (20) The massacre of rebelling citizens, on the orders of Nicolae Ceauşescu, with the approval of the leadership of the Romanian Communist Party, and with the effective participation of some units of the Army and the Securitate, during the anticommunist revolution of December 1989. As Head of the Romanian State, I expressly and categorically condemn the communist system in Romania, from its foundation, on the basis of dictate, during the years 1944 to 1947, to its collapse in December 1989. Taking cognizance of the realities presented in the Report, I affirm with full responsibility: the communist regime in Romania was illegitimate and criminal. In condemning the communist system in Romania, I affirm my admiration for the heroism of those who opposed the dictatorship, from the resistance fighters and militants of the political parties annihilated by the communists to the dissidents and opponents of the Ceaus¸escu period. Here, in solemn session of the assembled Chambers of the Romanian Parliament, I do homage to great statesmen such as Iliu Maniu, Ion Mihalache, Dinu Dinu Bra˘tianu and Ion Flueras¸, to the martyrs of the Church, such as Iuliu Hossu, Sandu Tudor, Vladimir Ghika, Richard Wurmbrand and Márton Áron, to the members of the democratic parties of Romania, to all the victims of the totalitarian communist regime, and to the opponents and dissidents. I want to express my esteem for the patriotic courage and dignity of all the survivors of the communist prisons, who are the last direct witnesses of our tragedy as a nation. Likewise, I want to extol the gesture of those intellectuals who directly raised their voices against Nicolae Ceaus¸escu: Paul Goma, Doina Cornea, Radu Filipescu, Mircea Dinescu, Dan Petrescu, Liviu Cangiopol and Gabriel Andreescu, and the desperate gesture, today wholly forgotten, of Liviu Babes¸, who, on 2 March 1989, burnt himself alive on the Bradu ski slope at Poiana Bras¸ov in sign of protest against a criminal regime. At the same time, I express my compassion for the sufferings endured by the vast majority of the Romanian people. Western radio stations – Free Europe, the BBC, the Voice of America, Deutsche Welle, Radio France Internationale – made an essential contribution in informing Romanian citizens regarding the situation at home and in the rest of the world. To the despair of the communist regime, Radio Free Europe was indeed what it set out to be – the speaking newspaper for Romanians everywhere. I do homage to the memory of Ghit¸a˘ Ionescu, Mihai Cisma˘rescu, Noel Bernard and Vlad Georgescu, men who fought with altruism and passion for the knowledge and utterance of the truth. I extol Monica Lovinescu and Virgil Ierunca, who, while physically in exile, continued to live every day for the Romanian people, keeping awake, through their unforgettable Free Europe broadcasts, the moral conscience of Romanians. In condemning this regime, the democratic Romanian State condemns its instruments, in the first place the Romanian Communist Party and the Securitate. I want to be well understood. I do not for a single moment refer to the great mass of Party members, whose sole activity was to pay their dues and to take part in monthly meetings void of any meaning. I refer to the institution of the “ruling Party”, thus to the apparatus which made the communist totalitarian regime possible. In the case of the Securitate, it was a case of an institution instrumental in shoring up the illegitimate and criminal communist totalitarian state. In the name of the Romanian State, I express my regret and compassion for the victims of the communist dictatorship. In the name of the Romanian State, I ask the forgiveness of those who suffered, of their families, of all those who, in one way or another, saw their lives ruined by the abuses of dictatorship. – I solicit the support of the Assembled Chambers of Parliament for my declaration of the condemnation of the crimes of communism, of regret and compassion for the victims of communism, in the spirit of Resolution no. 1481 of the Parliamentary Assembly of the Council of Europe on 25 January 2006. – I support the proposals of the Commission to establish a day of commemoration for the victims of communist terror and repression and the proposal to erect a Monument to the Victims of Communism in the Capital. – I support the establishment in Bucharest of a Museum of the Communist Dictatorship in Romania. This museum will in equal measure be a place of remembrance and one of affirmation of the values of open society. Besides the Museum, it is necessary to create a centre for documentation, with the scope of informing the public and giving unrestricted access, in which there will be gathered documents essential for an understanding of the communist phenomenon, of the labor camps, and of propaganda as a means of spiritual constraint. – I propose the setting up of a permanent exhibition within the Palace of Parliament, with documents illustrative of the idea of a political police, documents which shall be representative of the phenomenon of the violation of fundamental civil liberties in communist Romania. – I support the organization of a series of conferences in the major university centres of Romania, in which the contents of the Report shall be presented, accompanied by explanations, commentaries and illustrative documents. – I propose the formation of a group of researchers who shall elaborate an Encyclopaedia of Romanian Communism. The same group will work towards synthesizing the final Report in the form of a school textbook. – I support the necessary identification of legal solutions with a view to the annulment of judicial sentences handed down on the basis of articles of a political nature, the annulment of prison sentences and forced labour resulting from Decree 153/1970 regarding “social parasitism”, “anarchism” and any other “deviant behaviour”. The repudiation of Law no. 5 of 6 August 1978 on the basis of which labour contracts could be annulled for “deviations from socialist ethics and equity”. – I support a modification of the legislative framework whereby the granting of Romanian citizenship to those from whom it was withdrawn by the totalitarian state will be facilitated. – I support the modification and completion of the legislative framework regarding access to archives connected to the communist period. Seventeen years after the Revolution of 1989, the moment has come for transparency and access to the communist archives. The obstacles encountered by the members and experts of the Commission must be removed urgently and without delay. The law of the National Archives must be amended immediately as regards the terms of access to archives of national interest. Negligence in fulfilling the obligation to modify the Archives Law demonstrates a lack of political will to grant indiscriminate access to archives of interest for researchers of the communist regime. A democratic Romania is one in which access to history, therefore to the archives, is free and unrestricted. – I support the demands of former political prisoners in connection with public recognition of the tragedy they underwent. – I support the proposal regarding the establishment of a system of twelve grants, to be awarded annually, on the basis of a competition, to researchers interested in investigating various aspects of the communist dictatorship. – I affirm the necessity to adapt the Final Report for purposes of a didactic nature (a textbook about the communist dictatorship in Romania) which shall be taught in secondary education. Allow me to add that the application of the proposals I have assumed today will bear fruit only if we free ourselves of any partisan spirit. Seventeen years after the Revolution of 1989, no party in Romania should pursue the politicization of the act of condemning communism. My gesture today is the natural consequence of the fact that we have assumed, as a nation, democratic values. In the name of these values, we have the obligation to identify in our history those things which we do or do not want to define our identity as Romanians and future citizens of the European Union. However, the imported communism we experienced in our own lives for five decades is an open wound in the history of Romania whose time to heal has come once and for all. Evoking now a period which many would wish to forget, we have spoken both of the past and of the extent to which we, people today, wish to go to the very end in the assumption of the values of liberty. These values, prior even to being those of Romania or of Europe, flow from the universal, sacred value of the human person. If we now turn to the past, we do so in order to face a future in which contempt for the individual will no longer go unpunished. This symbolic moment represents the balance sheet of what we have lived through and the day in which we all ask ourselves how we want to live henceforward. We shall break free of the past more quickly, we shall make more solid progress, if we understand what hinders us from being more competitive, more courageous, more confident in our own powers. On the other hand, we must not display historical arrogance. My purpose is aimed at authentic national reconciliation, and all the more so since numerous legacies of the past continue to scar our lives. Our society suffers from a generalized lack of confidence. The institutions of state do not yet seem to pursue their real vocation, which relates to the full exercise of all civil liberties. In what happens in hospitals, in the process of the restitution of property, in the way in which the judicial process is conducted, in the relationship between public institutions and citizens, and in the reality of the penitentiaries, we can see that lack of respect for human beings has not yet disappeared. Perhaps some will ask themselves what exactly gives us the right to condemn. As President of Romanians, I could invoke the fact that I have been elected. But I think that we have a more important motive: the right to condemn gives us the obligation to make the institutions of the rule of law function within a democratic society. We cannot be allowed to compromise these institutions. They cannot be allowed to be discredited by the fact that we approach them with the habits and mentalities of our recent past. I myself have often criticized the imperfections of our political system, the inefficiency of certain institutions. But it is not the institutions of the state that are guilty, but the manner in which we make them work, the manner in which many think they should utilize them for the achievement of their own interests. Similarly, there are many who, overcome by the hardships of today, seem to have lost faith in the virtues of the democracy upon which we have embarked. They end up looking nostalgically to a past which, in the hard moments of this prolonged transition, suddenly begin to appear luminous. I shall answer them that it is worth reactivating their memory. Let them remember the cold, hunger, darkness and humiliation that had taken control of our lives. Unfortunately, in the houses of many Romanians, these things still exist today. We must not forget that no genuine society can be built upon the expropriation of its citizens’ liberties. No wellbeing is possible in a society of people who are not free. Perhaps the greatest evil done by communism was to ignore the meaning of freedom for human beings. Except that the institutions of democratic freedom do not function of themselves. In order to function, any administrative mechanism needs people who are qualified not only professionally but also qualified in democracy and freedom. We have seen how the communist totalitarian system simultaneously degraded the behavior of institutions and of people. We must recognize that communist mentalities continue to influence Romanian society. We believed that we could forget communism, but it did not want to forget us. Therefore, the condemnation of this past arises as a priority for the present, without which we shall behave in the future too in a way which resembles the burden of an unhealed illness. The memory of the crimes committed by the communist regime in Romania helps us to go forward with a more decisive step, to achieve the changes so necessary, but it also helps us to appreciate the democratic framework in which we live. The condemnation of communism will encourage us to be more circumspect towards utopian and extremist projects, which want to bring into question the constitutional and democratic order. Behind the nostalgic or demagogic discourses, there lies more often than not the temptation of authoritarianism or even totalitarianism, of negation of the explosion of individual energies, of inventiveness and creativity which has taken place since December 1989. We have definitively escaped terror, we have escaped fear, in such a way that no one has the right to bring into question our fundamental rights. The lesson of the past proves that any regime that humiliates citizens cannot last and does not deserve to exist. Now, all citizens can freely demand that their inalienable rights should be respected, and the institutions of state must work in such a way that people will no longer feel humiliated. During this period of transition, much has been said about the moral crisis of society. It relates to numerous aspects of daily life. I am certain that we shall leave behind the state of social mistrust and pessimism in which we have been submerged by the years of transition if, together, we undertake a genuine examination of the national conscience. My declaration today and the proposals I have presented to you will encourage this process. I do not want to become “the President who condemned communism”. I want only to be the head of a state which considers that this condemnation relates to normality, that, without this condemnation, we shall move forward with difficulty, we shall move forward while continuing to carry on our back the corpse of our own past. All that I want is for us to build the future of democracy in Romania and the national identity upon clean ground. I thank you all. A Merry Christmas and a Happy New Year to all Romanians!